Rest assured that we have carefully selected our drivers: They have many years of experience, hold clean backgrounds, and have undergone professional defensive training and have an in-depth knowledge of Kuwait. You’ll find that all of our drivers are courteous, professional, and reliable. Noone forgets Deepak if ever been greeted by him, he never let his 5 star ratings to go down, his courteousness is unforgatable. He has completed 220 Hrs of Chauffer training. Kuldeep has proven his passion of hospitality by making every trip memorable to his customers. He has completed 280 Hrs of chauffer training. Every driver goes through intensive defensive driving safety training accreiated by British Safety Council, Medic First Aid and IOSH. RoSPA Fleet Safety is working to reduce occupational road risk using innovative, behaviour-based solutions. 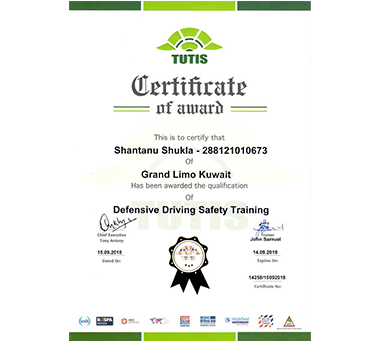 Our goal is to be the global leader in driver and fleet safety. One tap and a car comes directly to you. Hop in, your driver knows exactly where to go. 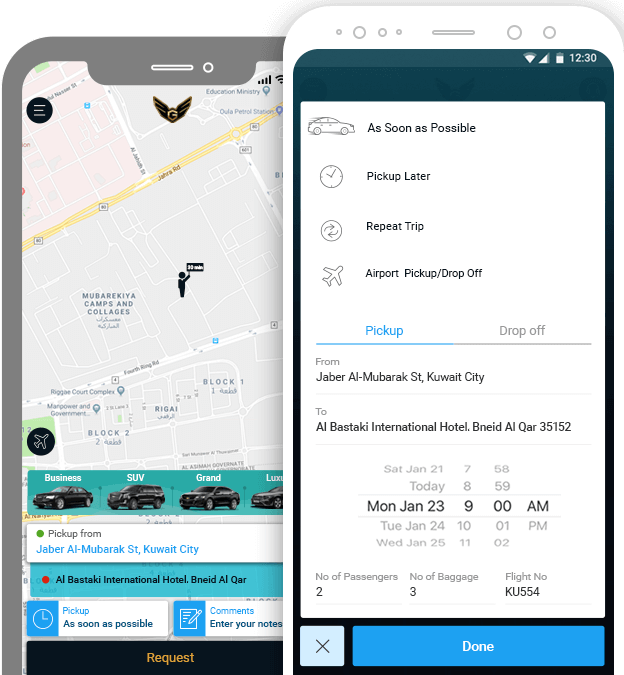 We value your time, whether its an airport drop or a regular ride, our driver will arrive to your pick up location atleast 15 mins before to you to assist on your luggage and make you comfortable. All cars are equipped with onboard payment terminals where the passengers can use K- Net and all major credit cards issued locally and international. We will also accept cash and passengers can avail great discounts by paying through wallet account inside the app. Passenger security is always our primary responsibility, We choose drivers after background checks and each driver goes through 100 hours of professional chauffeur training. All cars are installed with security cameras for your and your families safety while onboard. In Kuwait, specially when I needed it the most (I have a broken toe + our driver is on vacation) and decided to try it today. I installed the App and registered with my email and then requested a driver this morning! A couple of minutes later, I got a call confirming my request and the driver was on his way to me. The App allows you to track the driver just like Uber, and as promised, he was outside my house on the scheduled time! Copyright © 2019 GrandLimo. All Rights Reserved.